It is difficult to identify the fighters of the Forces Démocratiques pour la Libération du Rwanda (FDLR), one of the many armed groups active in eastern Democratic Republic of Congo (DRC), some of whose leaders played a key role in Rwanda’s genocide 20 years ago. Bearing neither uniform nor insignia, they are indistinguishable from the civilian population. The pangas (long knives) the FDLR carry in North Kivu Province’s Rutshuru Territory village of Bishongera are commonplace within agricultural societies and the AK-47 assault rifles and rocket-propelled grenades have been stashed since the DRC national army (FARDC) and Malawian soldiers from the UN Stabilization Mission in the DRC’s (MONUSCO) Force Intervention Brigade (FIB)began preparations in the area for an offensive against them. In the valley below, a UN helicopter gunship traverses Virunga National Park. The clatter of its rotors does not elicit a glance from the roughly 10 young men in gumboots, some brandishing pangas, gathering around the only bench in the village where a senior FDLR officer, Agathe Nzabonimana*, wearing black shoes, sits. He barks orders at the encroaching men in Kinyarwanda and they move away. He tells IRIN: “We [FDLR] don’t have uniforms. We don’t have support from a foreign country” - a direct nod to M23, an alleged proxy force of neighbouring Rwanda. 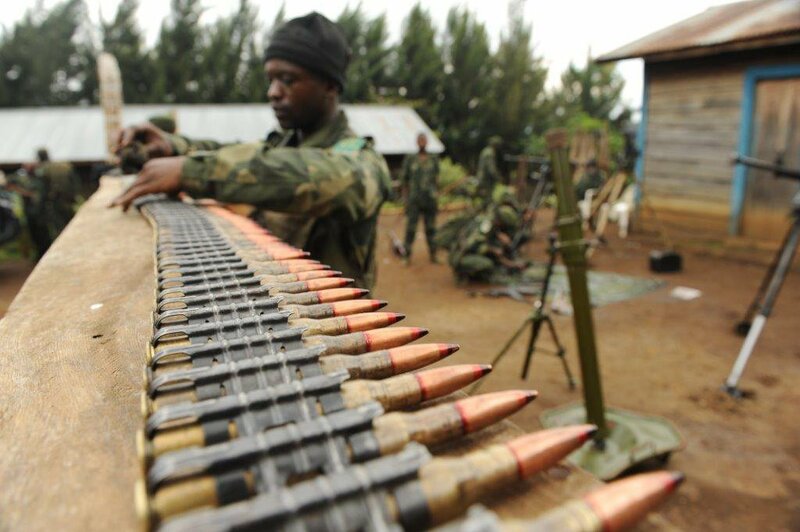 "Upcoming military operations carry with them high risks for the civilian population of DRC"
M23 was the first armed group targeted by FIB, established after a February 2013 UN Security Council resolution to “neutralize” and disarm all armed groups in the country. FIB has since moved its sights to other armed groups. The 3,069 strong FIB - a unit shorn of any civilian functions - is made up of soldiers from Malawi, South Africa and Tanzania and equipped with heavy weapons and helicopter gunships and works in tandem with the FARDC. Military operations in North Kivu Province are either under way, or in preparation, in the districts of Masisi against Janvier Buingo Karairi’s Alliance des patriotes pour un Congo libre et souverain (APCLS); in Beni against the Allied Democratic Forces (ADF-Nalu) an anti-Ugandan militia; and in Rutshuru against the FDLR. A host of NGOs in a joint 5 March 2014 correspondence to the Security Council on the renewal of the “robust” military mandate noted the “upcoming military operations carry with them high risks for the civilian population of DRC”. But the heavy weaponry of the intervention brigade - which proved decisive against M23 – will be less effective against the FDLR, which has integrated within Congolese communities over the past two decades. In Tongo, where soldiers are gathering with the support of FIB’s Malawian contingent, an FARDC major in the 601 Regiment - more commonly referred to as the Chinois commandos in deference to their three years of training by Chinese military instructors - told IRIN “the difference between M23 and the FDLR, is that the FDLR mix in with civilians. "The difference between M23 and the FDLR, is that the FDLR mix in with civilians"
“M23 had military emplacements, so when we used heavy weaponry, we knew we were hitting military targets. It makes FDLR very hard to attack… The FDLR is essentially using them [civilians] as human shields,” he said. “There are FDLR in every village [of the Rutshuru operational zone]. The local population does not collaborate [with the FARDC] as they fear retribution after we leave. So they will not identify the FDLR,” the major said. FDLR was formed by the remnants of the Forces armées rwandaises (FAR), the national army of Rwanda, and the Interahamwe, a Hutu Power militia that drove the genocidal ideology and led the 1994 genocide. 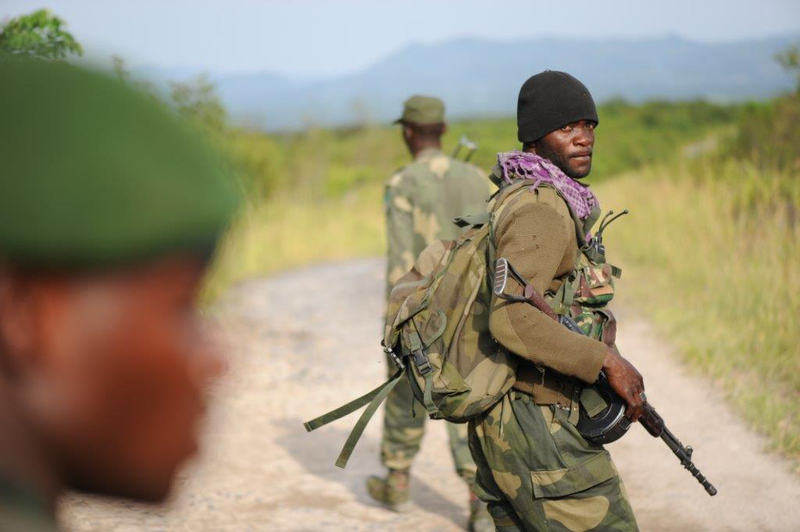 After 20 years in neighbouring DRC, the armed group has survived by recruiting from the local population. Even so, its strength has diminished from more than 10,000 to about 2,000 over the years, according to some estimates. Although the FDLR has made several vain appeals for talks with Kigali over the years, some of its leaders have never fully renounced their Hutu Power ideology – which provided the genocide’s “logic” and their ambitions to seize power by force in Rwanda. A construction engineering graduate, he served four years with FAR and has spent the last 20 years with FDLR. “The general question I always ask myself is why we are called criminals by Rwanda. When the genocide happened I was fighting the RPF [Rwandan Patriotic Front], an invading force. The solution is negotiations between FDLR and [President Paul Kagame’s] Rwanda… Why were there negotiations with M23, but no negotiations with FDLR. I cannot go back to Rwanda. I will be imprisoned or killed,” Nzabonimana said. Bishongera is one of four villages on the about 14km path to Tshai from Tongo where the FDLR’s North Kivu commander, General Ntawugunka “Omega” Pacifique Israel, is thought to be based with more than 1,000 soldiers. In March 2014 the FARDC captured Kilometre Nine, an FDLR bush-base of about 20 soldiers on the Virunga National Park road between Kalangera and Tongo. After a 25-minute fire-fight, with the support of Malawian troops, the position was overrun and two FDLR soldiers killed, according to FARDC. “Regardless of the actual ties between Rwanda and M23 [or its predecessors Congrès national pour la défense du people, CNDP, and Rassemblement Congolais pour la Démocratie, RCD], the presence of these militias can be seen as a facilitating element for FARDC-FDLR collaboration,” Vogel said. Whether there was some political deal between Kinshasa and Kigali about the fates of M23 and FDLR “is hard to speculate,” but “MONUSCO and the UN Security Council may have given assurances to the Rwandan government that they will not only tackle M23 but also FDLR. "When they were drinking together they [FARDC] used to joke: `The FARDC helped return M23 to Rwanda. Now we must help the FDLR return to Rwanda"
“The current deadlock in anti-FDLR operations puts the credibility of both MONUSCO and FARDC in peril and bears a risk of souring bilateral exchange as Rwanda currently commemorates the 20th anniversary of the genocide,” Vogel said. When unfounded rumours in January 2014 swept through eastern DRC that Kagame had died “the whole [Tongo] population celebrated. FARDC celebrated more than FDLR,” he said.